Here is a great article I came across that will help many of us achieve our goals in the new year. Two of the most popular New Year's resolutions are always "lose weight" and "exercise more." It's all about getting fit in 2013: slimming down, toning up and building that beach body that will last the whole year round. 1. Small Steps, Big Picture: Lifelong fitness is a journey, not a sprint, so treat it as such by defining your "Big Picture" (goals) and then focusing on how you'll get there, day by day. If your goal is to get six-pack abs, it won't happen overnight; if your goal is to lose 10 pounds while tightening things up, the scale won't change dramatically by morning. But whatever your fitness goal, it will happen over time if you focus on the big picture while taking small, progressive, determined steps to get there. Tip: Don't miss a workout unless you absolutely have to (e.g., you're sick), and never take off because "I just don't feel like going to the gym." Instead, schedule mini-breaks (2-3 days off) every month or so to stay refreshed and avoid burnout. And don't be afraid to be flexible; brainstorm as many ways to exercise as possible so you can mix things up on any given day. Sick of the treadmill? Then take a brisk walk / jog around the neighborhood. Raining all day? Then do jumping jacks, lunges and other muscle-toning, fat-burning activities in your garage or basement. 2. Singular Focus, Group Support: Let's face it: Your friends, family and co-workers can encourage you to get fit, lose weight, etc., until they're blue in the face, but until you believe you can do it and challenge yourself to make it happen, it won't happen. Focus and determination are what keep you going, even on the days when you don't want to go anywhere but back to bed. That said, you also need a circle of support to help you through the rough patches that are sure to crop up on your journey to a fitter, healthier you. Whether it's a loyal workout partner, a "You can do it!" e-mail or a personal trainer, find someone – or better yet, multiple people – who can accompany you on your quest. Tip: Track your workouts online. 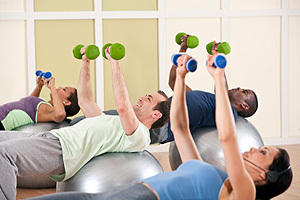 Many gyms offer online support, as do GPS apps such as Endomondo. And Facebook can be a great way to share your ongoing fitness experiences and get the support you need. The more you invest yourself and those around you in your journey, the less likely you'll be to just "give it up" in a moment of weakness / frustration and revert back to your motion-limited, fit-less ways. 3. Less Chore, More Routine: While exercise, like life, requires a certain amount of variety to keep it from getting boring, there's also great value in routine, particularly when it replaces the sense that what you're doing is a chore. For many people, transitioning fitness from chore to healthy routine is the key step in embracing it as a part of their life, rather than a temporary diversion or annoyance. It's not about having to do it; it's about wanting to do it. Tip: Calendar all your workouts for a given week / month and schedule reminders that pop up on your phone / computer. Before you know it, "Go to the gym" will be just another part of your daily routine, not something you agonize over day after day or "forget" about because it's not a priority. And by the way, if you schedule other important events / dates in your life as well, you'll develop a well-rounded, functional routine that keeps you in your personal loop and maximizes efficiency. It's about organizing your life so fitness –and everything else you value – fits in.